I thought this only happened at the beach - To grrr, or not to grrr? That is the question. 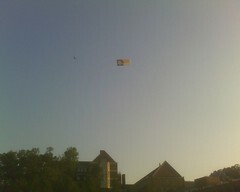 You can't tell so well due to mobile phone camera, but it was an advertisement for Geico. They just circled the campus over and over again all evening. The same one has been flying over NCSU for a week or more now. I saw the Geico caveman flying over the local Harris Teeter yesterday afternoon as well. Yep...saw it here in Chapel Hill when I left work yesterday...guess they're getting hard up for customers since they can't provide the cheapest rates after all!! John just switched!! When you left work? Did you get the job here at UNC-CH? Nah. They gave it to a guy that nobody likes and apparently is a known slacker. Go figure! I work at the 54/40 exit 273a area. It was flying around there as well. Oh, OK. Sorry to hear about the job. :( I forgot that you worked this close to my area. I thought it was a UFO.